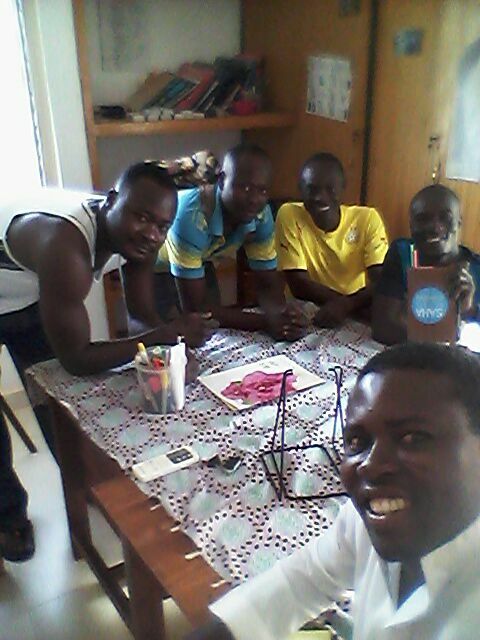 As many of you know, we hosted our Summer Global Leadership Program in Ghana this June. 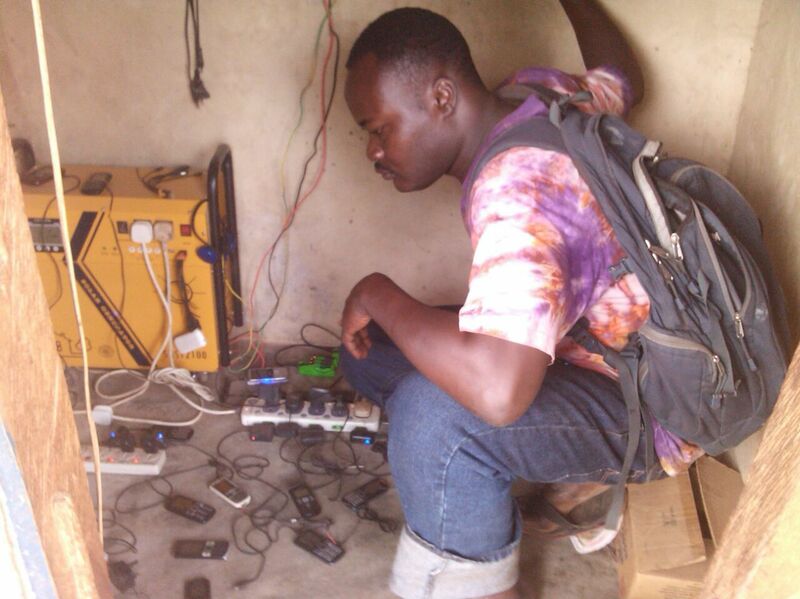 During that time, Peter, our Director of Ghana Programming, was in charge of monitoring ALL of Saha’s water and solar businesses on his own. He did a great job of troubleshooting and making sure our entrepreneurs had support during the month, but we were unable to record consistent data. For that reason, we are skipping our June monitoring update and moving right from May to June. Below are the monthly summaries for both months. The July report only shows data from the last week of July, while May shows 4 weeks worth of data. May Week 1: Janakpeng, Gbrama, Manguli 2, Sakpalua, Voguyili, Kpenchila, Wuvogumani, Wuvogu, Moya ,Takpuli, Nyamaliga, Cheeko, Kpanshegu, Kudula, Jarigu, Sakpbarigu, Tijo, Tindan,NamduII, NamduI, Gundaa, Kasuliyili, Kpachiyili, Manguli, Buhijaa, Djello, Kabal, Kalinka, Tohanaayili, Nekpegu, Gbandu, Garizegu, Bogu, Kuldanali/Yapalsi, Wambong, Galinzegu, Kurukuvohayayili, Balampuso, Jangbarigiyili, Chanyili, Kpalung, Laligu, Yapalsi, Libi, Gbung, kabarashe,Sabongida, Kabache 1, Kabache 2, Kideng and Tunga. July Weeks 1 & 2: Sabonjida, Original Kabache, Indigenous kabache, Kideng, Tunga, Kpalbusi,Gidanturu, Chanaayili, Jarayili, Wambong, Kuruguvuhuyayili, Kpalyn, Laligu, Yepalsi, Changyili, Jangbarigiyili, Yekura, Jabayili, Zanzugu yepala, Galinzegu, Zanzugu, Yapie yepala, Komlanyili, Kpanshegu, Takpili, Yepala, Chani, Jarigu, Cheko, Manguli II, Gbrama, Bamvim, Djelo, Manguli, Buhijaa, Bogu, Tindan II, Kuldanali, Gbandu, Gariezegu,Kagbal, Gurumanchayili, Dundo, Kpaliga, Kpachiyili, Kasulyili, Tindan, Chandanyili, Tindan, Tijo, Kpalguni, Jabayili, Sagbragu, Namdu, Namdu II, Warvi. 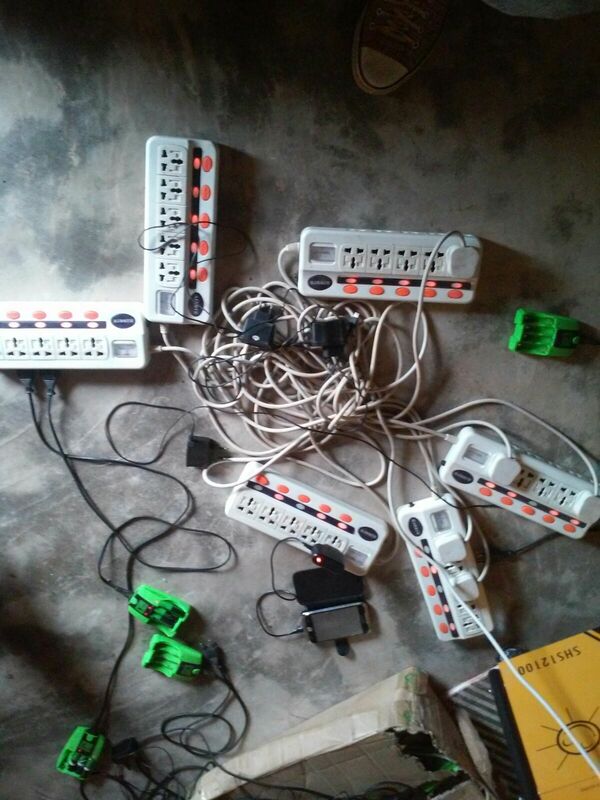 Yapalsi, Wambong, Kuruguvuhuyayili, Galinzegu, Zanzugu, Yakura, Jabayili, Zanzugu yepala, Yapie yapela, Chandanyili, Kpalguni, Jagberin, Namdu I, Namdu II, Warvi, Jarigu, Cheko, Nyamalga, Manguli II, Janakpeng, Gbruma, Komlanyili, Bamvim, Kpansheg, Kalinka, Nekpegu , Tohinayili, Kuldanali, Kagbal, Bogu, Tindan II, Voughyili, Moya, and Kulaa. Kpanshegu, Cheko, Komlanyili, Jarigu, Chani, Manguli, Gbruma, Kalinka, Tohinayili, Nekpegu, Manguli, Buhijaa, Djelo, Kuldanali, Bogu, Tindan, Gurumanchayili, Dundo, Kagbal, Gbandu. The biggest success stories from May and July all have to do with the RAIN! After months of waiting, the rainy season finally arrived. The rain started slowly in May, but it rained frequently enough to fill many of the dry dugouts. By July, the rains were here in full force, filling all of the remaining dry dugouts! Of course, with the rain also comes some challenges. 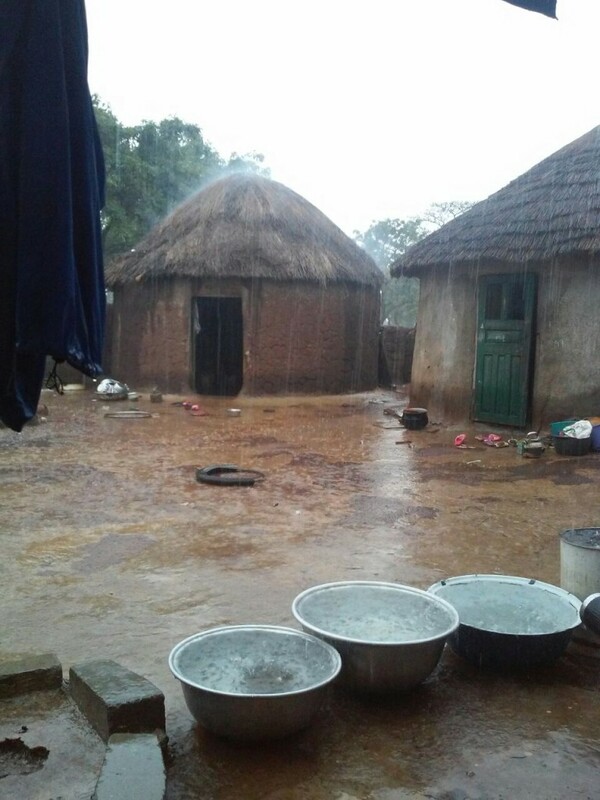 Sales often slow during the rainy season as many families collect rainwater to drink. But, at Saha we really view this as a positive thing. 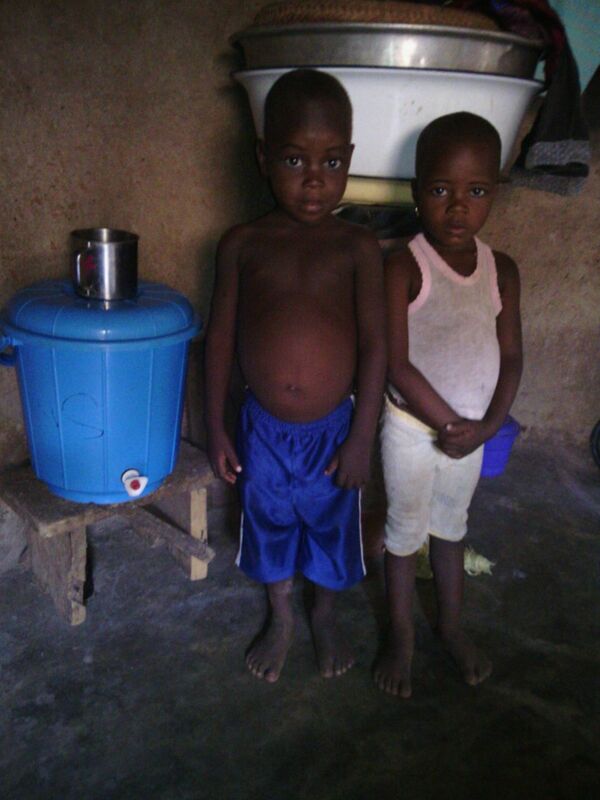 Families are able to access clean drinking water for free. As long as they harvest it directly into their safe storage container, they can prevent re-contamination and have safe water for their family. 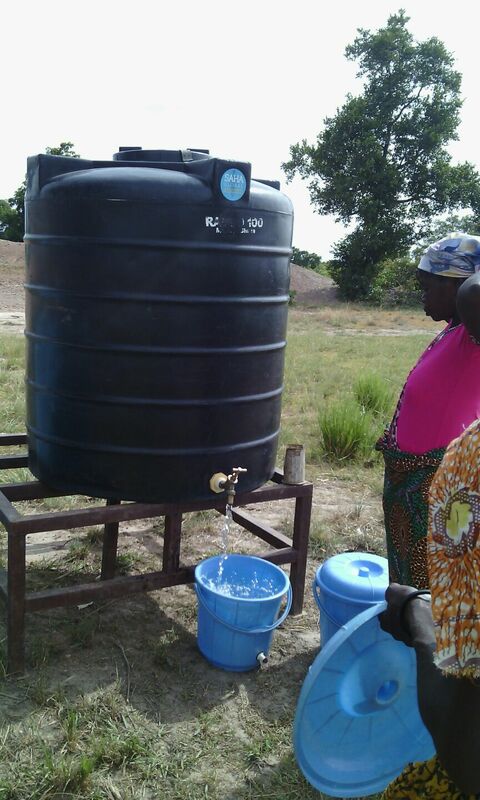 Some water businesses, like the one in Gburma, move the water treatment centers to town and collect rainwater from a tin roof. They then treat it with chlorine to keep it clean in the polytank. But, many business just adjust their schedules to make up for the slower sales and know that when the rains end, business will pick up again. Our Saha team takes samples of the rainwater from people’s homes to ensure that they are collecting and storing it correctly and truly drinking safe water. 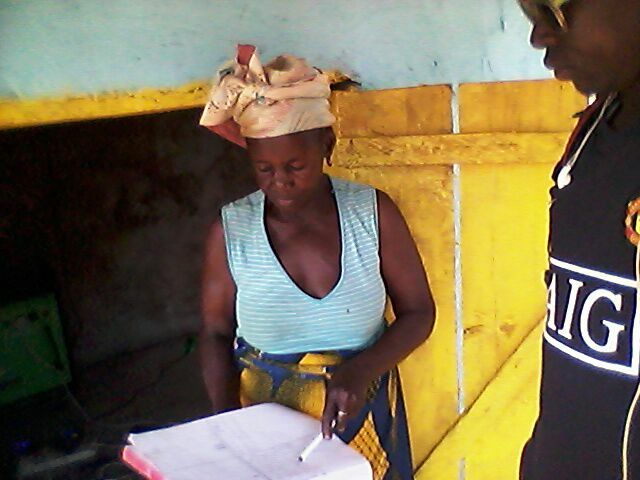 In July, our Ghana team decided that Gbandu, Chandanyili, Garizegu and Kpanayili were all ready to graduate and become “independent villages.” This means that the water businesses in these communities have been running smoothly for years and that the women entrepreneurs are able to handle any issues that arise. 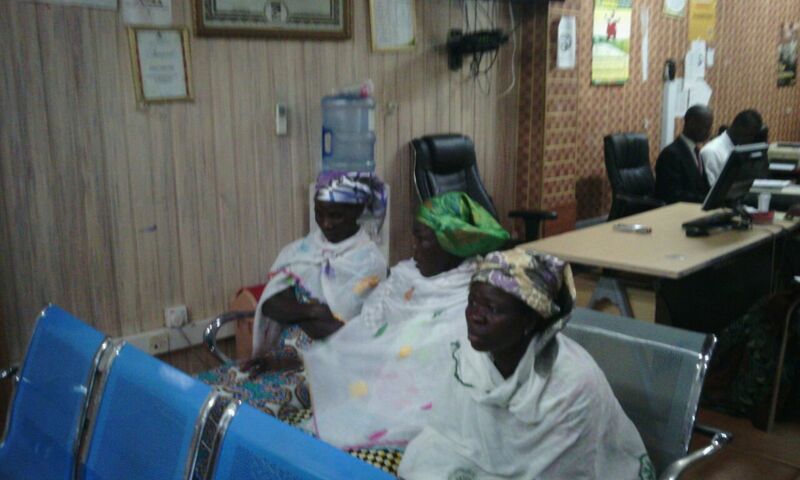 Saha only visits independent communities once a month to check in with the women. Ghandu and Garizegu were ready to graduate because they now have running pipes in their communities, that provide clean water to the town. 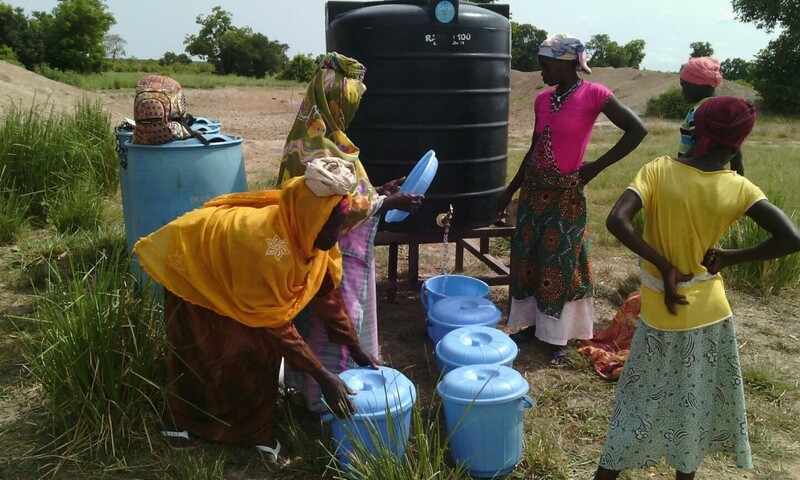 As we mentioned in April, the women keep treated water in the polytanks for the days when the government turns off the pipes. The entrepreneurs in these communities handled the transition to piped water so well, we knew they were ready to be independent. Chadanyili and Kpanayili also mastered big transitions: the change in season from dry to rainy. This was not the first seasonal transition for either community and the entrepreneurs dealt with issues like dried dugouts and rainwater collection so well this year, we knew that they were also good candidates to become independent. Congratulations ladies! 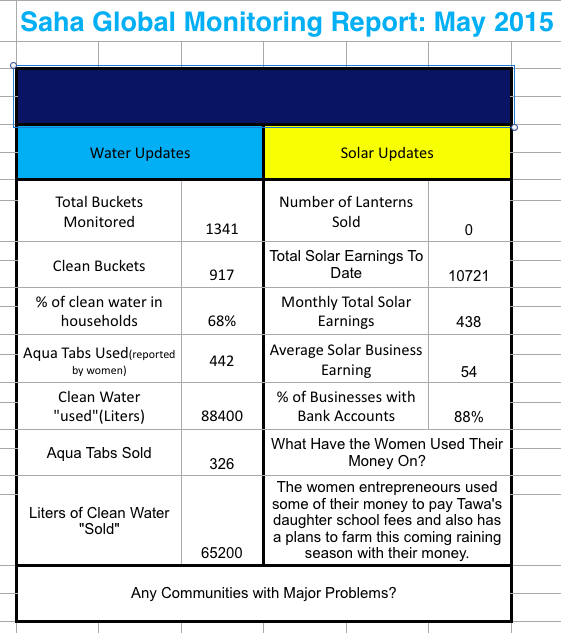 In solar news, we had a lot of success in May and July. Shanka, Zelia, and Rahi from Djelo opened a bank account in July! 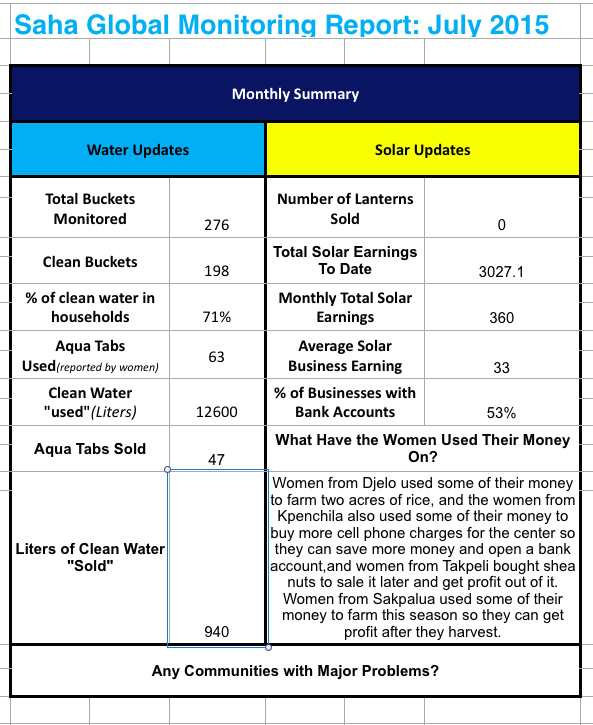 Since we added 7 new solar businesses in June, the % of solar entrepreneurs with bank accounts listed in the chart above decreased, but the number of communities with bank accounts is increasing! We are so proud of the entrepreneurs from Djelo for taking this big step! 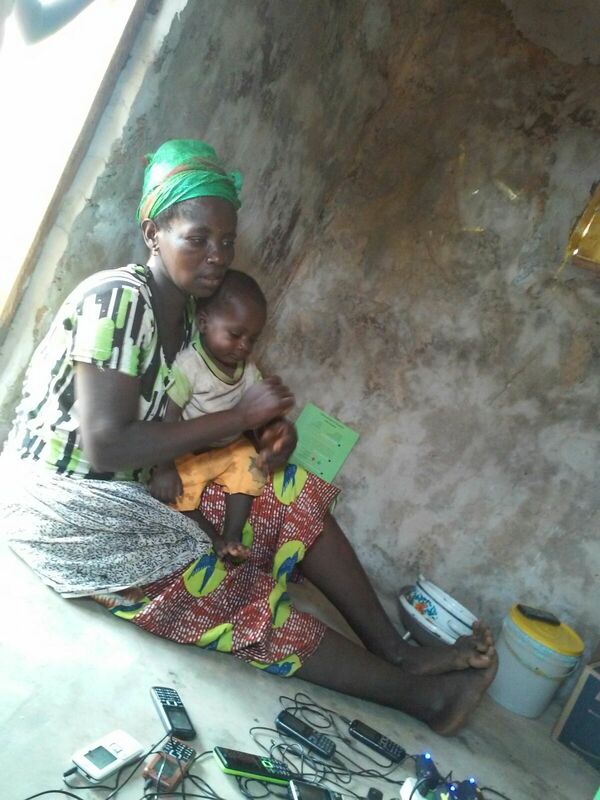 In Sakpalua, Tawa used some of her profits to pay her daughter’s school fees. 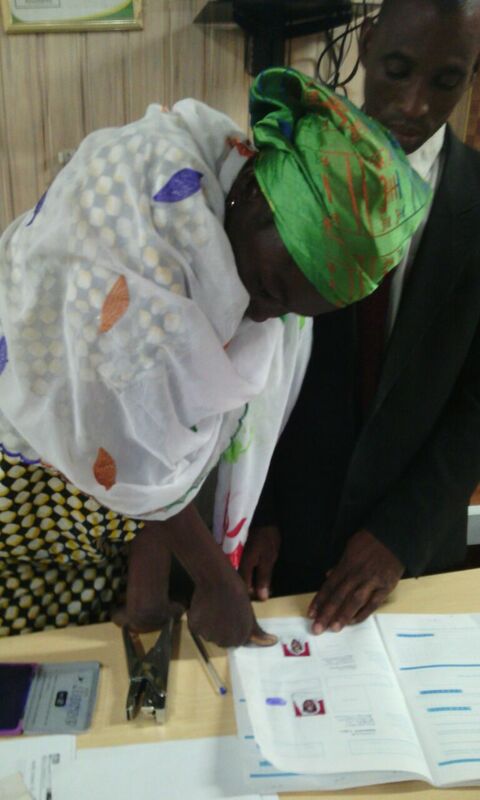 The rest of the women reported that they plan to purchase additional land to farm on this year. In Kpenchila, the entrepreneurs used some of their profits to buy more cell phone charges for the solar center so people who lost theirs can still come charge. 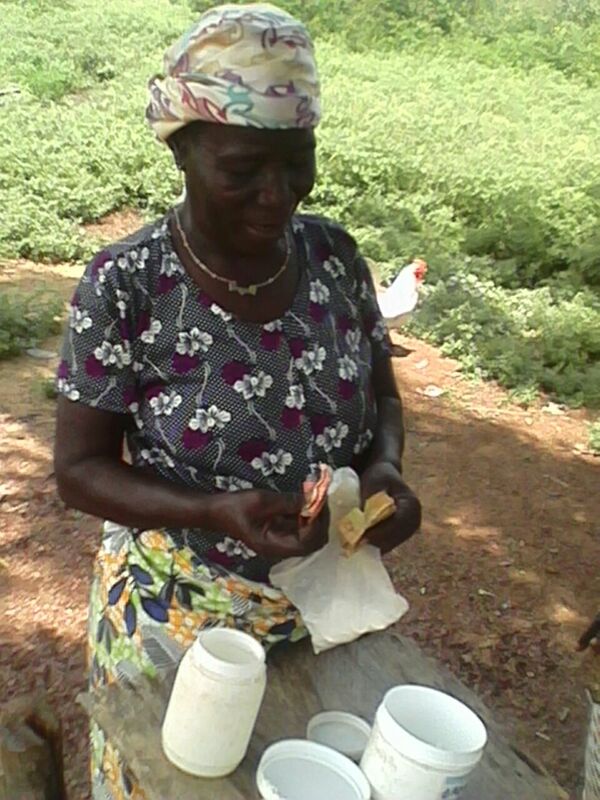 In Takpuli, the ladies bought shea nuts with their profits and plan to sell shea butter to make even more money! Perhaps the biggest solar success story, however, was from Yapalsi. 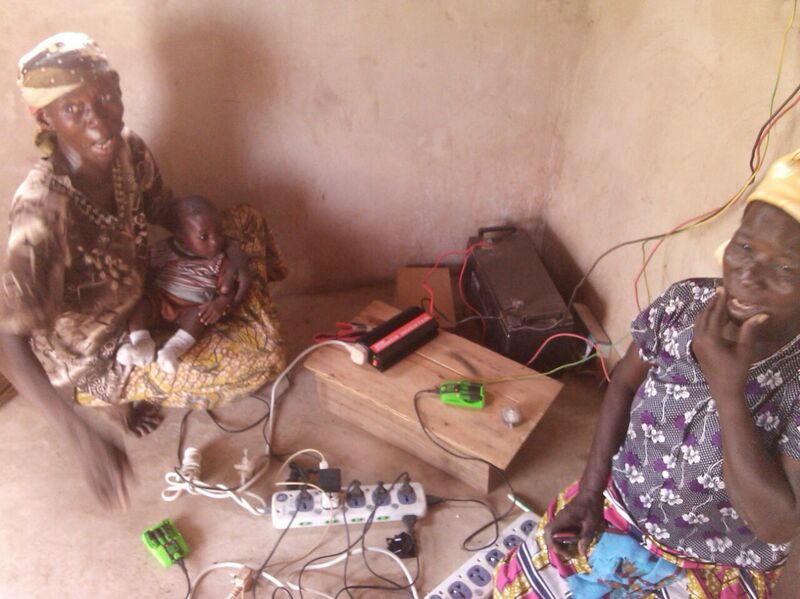 In June, Yapalsi received electricity from the government. Now all of the homes in the community are hooked up to the grid! 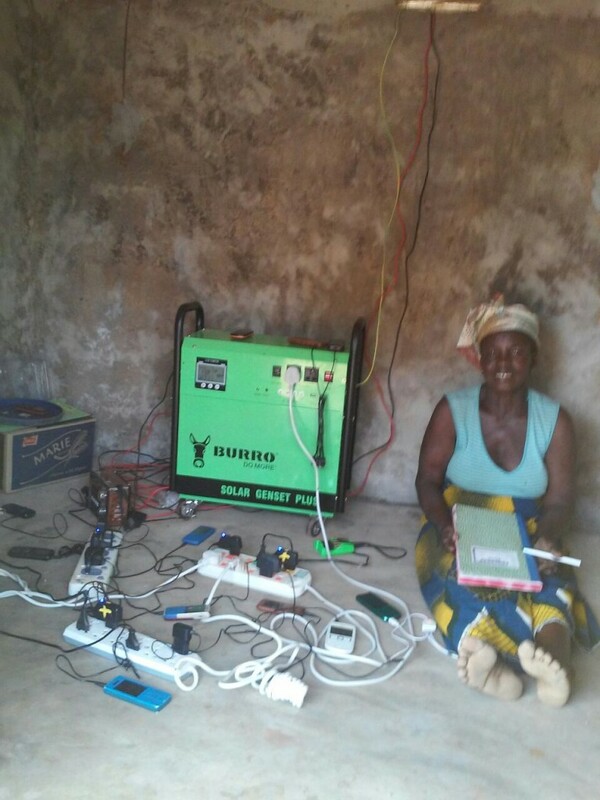 Now, this may seem like a challenge for the solar business, however, Sanatu and Asheitu are smart entrepreneurs and are already planning their next venture! They are going to use the money that they saved over the past year of running the solar center to start a grinding mill in the center of town. 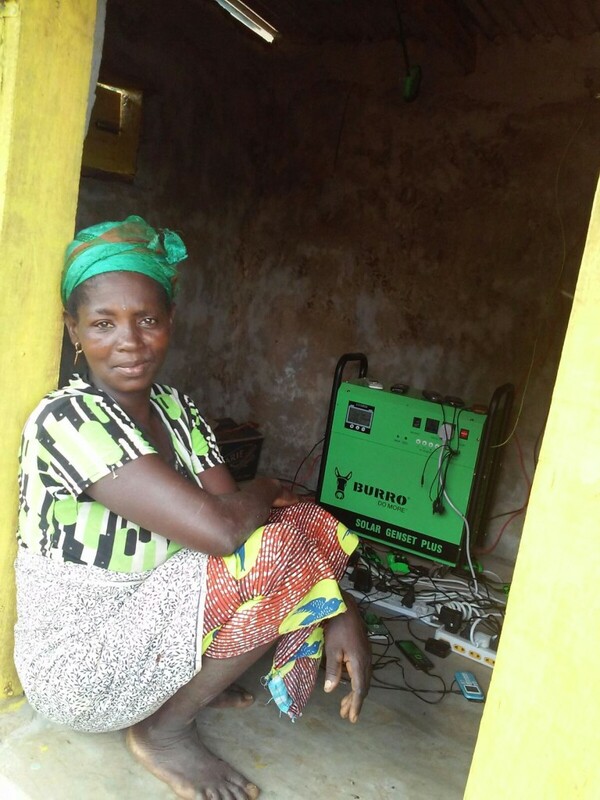 They are also keeping their solar business running for the days when there are blackouts (which are frequent in Ghana), but they are very excited to add a grinding mill to the solar center as a new source of revenue! Luckily, there were no major challenges in May and July. In early May, many dugouts were still dry, but by July every dugout was full of rainwater. 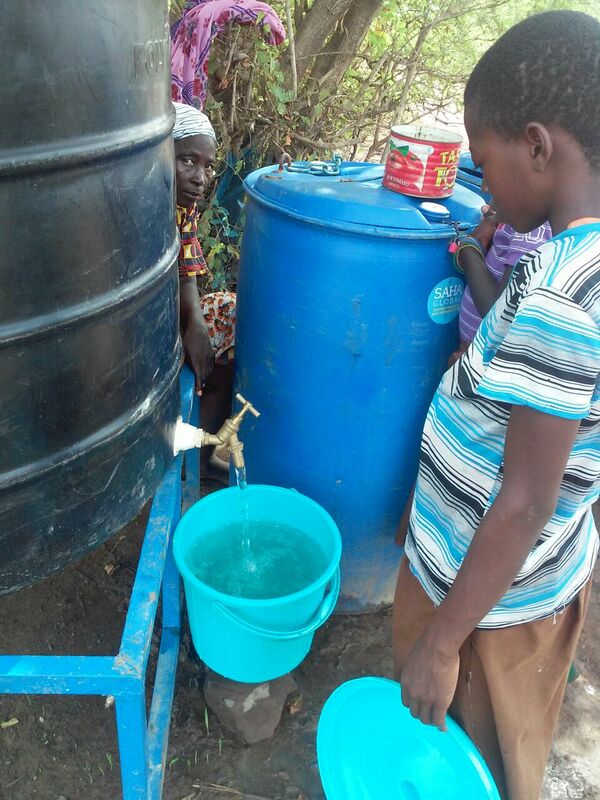 As we mentioned above, most water businesses have low sales through the rainy season, but people have access to clean drinking water, which is the number one goal of Saha Global. The entrepreneurs are able to adjust their schedules to make up for the slower season and they all know that sales will pick up when the rains slow. There were a few leaky polytanks, but all were easily fixed. 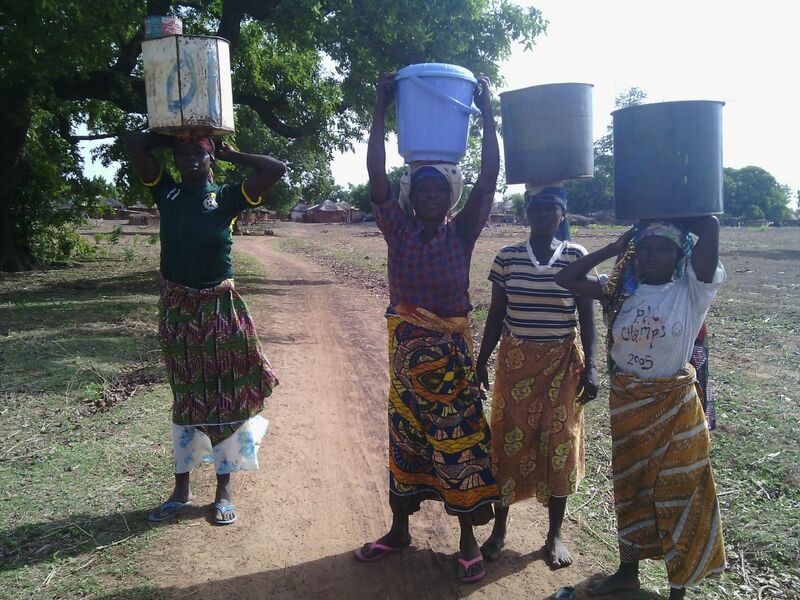 In Kuula, the dugout has been expanded and now it’s too steep for the women to carry water up to the location of the water treatment center. They are going to move their center to a new location and change out their cement polytank stand for a metal one so that its easier to move in the future.